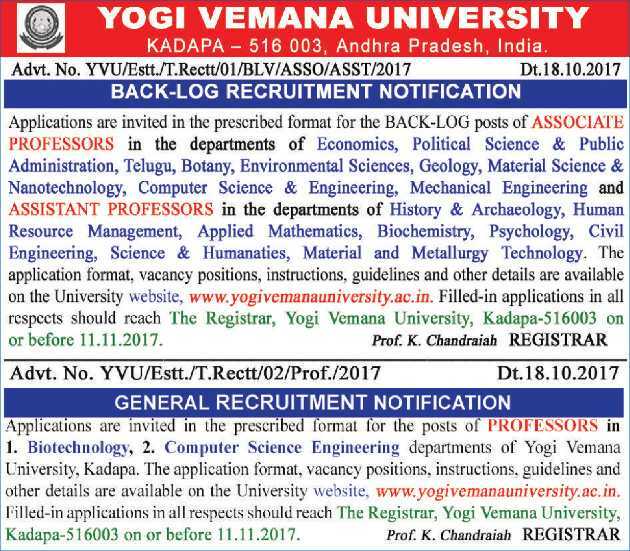 Yogi Vemana University, Kadapa has advertised in THE HINDU Opportunities newspaper for the recruitment of Associate Professor / Assistant Professor jobs vacancies. Interested and eligible job aspirants are requested to apply on or before 11th November 2017. Check out further more details below. About University: As an Emerging Premier State Varsity dedicated to Teaching, Research and Service Yogi Vemana University came into existence by the Act of the Andhra Pradesh State Legislative Assembly with effect from March 9th 2006. It is located 15 km away from Kadapa city on the Kadapa-Pulivendula Road. How to Apply: Interested and eligible candidates are required to send their application filled in prescribed format download from http://www.yogivemanauniversity.ac.in along with copies of certificates and recent PP size photo to the address mentioned below.